A Barn Raising In Photos – How to Build A Barn When You Haven’t a Clue How to Do So. Our recycled barn as it looks today. 100% nuts! Looking back – that’s what we were! The idea came with a simple pencil drawing over the winter of 2010-2011. It was what we hoped would someday become the barn to our little farm. I’m not even sure how it really started, but the dream grew from that little drawing. Our hope was to be able to build the barn using some reclaimed lumber from an old barn. What it became was a project of tearing down two barns and building a new one from it. It started as a wishful drawing in the fall of 2010. As we get ready to host our first ever barn party this weekend – we took a second to look back in photos at our once in a lifetime project. I will be the first to tell anyone we are not barn builders. We did a lot of things completely backwards : i.e. – who puts up walls before a roof, and even more – who starts hanging signs in the barn for decoration without a roof! But we built things when we could and when we found materials. So it didn’t always follow traditional building plans. We re-used and recycled everything we could find a use for – like the old roof barn to become our new barn’s lower siding. But we had a vision – and we stayed the course with a lot of help from friends and family – and a lot of advice from a lot of people. Late 2010 – A big pile of overgrown brush waits to be cleared. October 2010. It took us an entire weekend – but the brush is cleared and mowed off. Early in April of 2011 – we marked out the barn with some string and stakes. June 2011. Leveling the land. Our neighbor Dave came in with his bulldozer and leveled off space for the barn pad. He has some serious grading skills and is amazing to watch work. July 2011 – We tear down the Cardington Barn piece by piece and haul back to the farm. Sore – Sore – Sore nights!!! Late July 2011 – Next up came the digging of the poles. I have to say a bobcat and an auger bit are much easier on the body than digging by hand! 2nd week of August 2011. Taking a break from our pole setting – we tear down Dad’s barn with the help of Family and Friends. It should be noted this went much smoother and easier on the muscles with the added help of extra hands taking it apart! Mid August 2011. So not the normal way to build a barn – but we started to put up the lower walls with the roof from dad’s barn. We wanted to make sure it fit and looked good. Mid August 2011. So who needs a roof when you can put up walls. We had the boards so next went the rough sawn pine. We milled down the old board from dad’s barn to use as the batten strips. We also brought out the doors from the house and leaned them up where they would eventually be hung. 2nd week of September 2011. We cut all of the rafters in a few days – the hardest part was making the first one. This is where the pergola building skills payed off !! At least we were used to making a lot of precise cuts! 1st of October 2011. Finally – with some HUGE help from my brother Bob and two brother-in-laws Brian and Rob and a nephew Ryan – we put up all of the rafters on a beautiful fall day. Family can save you! Late October 2011. We began the process of putting up the roof. Mary and I would put up a panel or two each trip – then we had some late help to finish it off from a good friend Nate and my brother-in-law Brian again. December 2011. With the roof on – and over the course of the winter months – we installed the loft and began to close in the upper sides. Late February, 2012 – We installed the barn doors that had been leaning there “pretending” to be hung. It was a great feeling to finally close the doors with a roll. March / April 2012 – Finally, something we know how to do 🙂 We began to mount the barn pergola in early spring. Late April 2012. 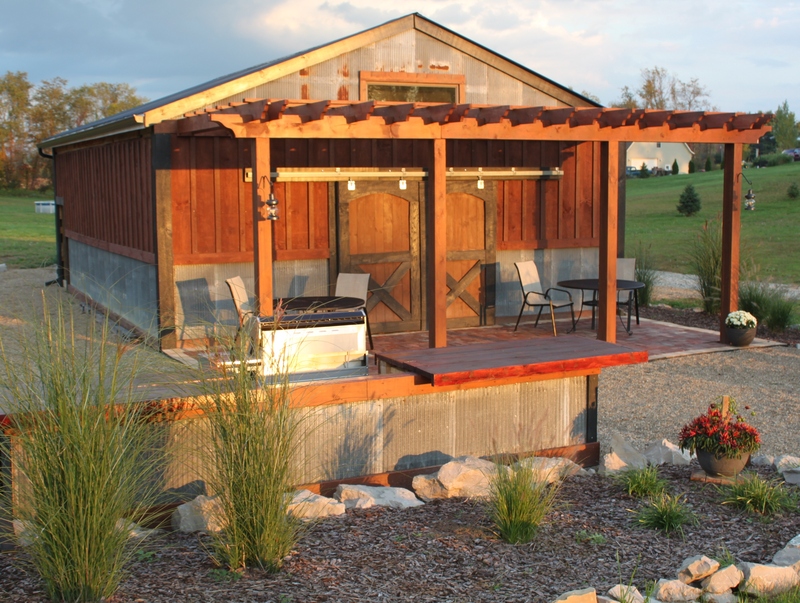 Barn pergola finished up and stained – on to the landscaping! May 2012. In between spring rains – we also began work on the back landscaping wall – first up – installing all of the drain tile to carry water away from the hill behind the barn. Late Mary 2012. It was nice to finally have the gutters installed – it allowed us to finally get the water holding tanks set up and working. Late May 2012 – one of our biggest accomplishments – getting the rainwater collection system installed. It has allowed us to water all year through a hot summer with 100% reclaimed rain water. So far to date – we have used over 1000 gallons of rainwater in the garden. June 2012. Next up – using all of the reclaimed brick to make the patio – this didn’t really take too long – we had it finished up within a couple of days. ← The ‘Must-Haves’ for Canning!